It seems even police officers are starstruck when the man known as Brampton's Batman cruises down the road in his Batmobile. It seems even police officers are starstruck when the man known as the Brampton Batman cruises down the road in his Batmobile. On Aug. 18, Stephen Lawrence — who prefers to be known as Batman — says he was pulled over by an Ontario Provincial Police officer so she could get a photo with him. "I don't want to get the officer into any trouble at all because ... they do get excited when they see something unusual," Lawrence told As It Happens guest host Helen Mann. The photo opportunity came about while Lawrence, who has been dressing in a Batman outfit for years because he feels a personal connection with the comic book hero, was driving home from Parry Sound, Ont. Lawrence said he was driving down Hurontario Street when he noticed that other drivers were taking photos and videos of him. "I try to avoid this because not only is it illegal, but also it is unsafe," he said. As he pulled up to a red light, he waved down a police officer next to him and asked for the drivers to be dissuaded from taking photos. The officer agreed and Lawrence continued on his way. A little while later, he noticed lights from the same police cruiser behind him. "I pulled over, jumped out and I asked the OPP officer, 'Is everything OK?'" Lawrence said. That's when he said the officer asked for a photo. 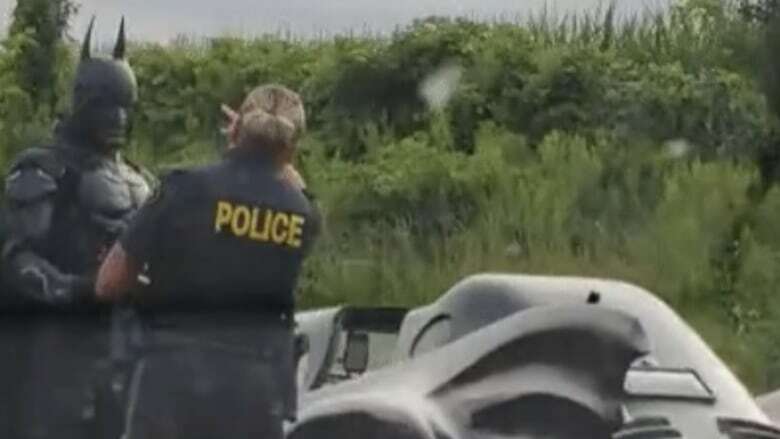 The video of Batman dramatically hopping out of his Batmobile after being pulled over was posted to Reddit, with users wondering what the Dark Knight could have done wrong. Lawrence said this is not the first time an incident like this has happened with police, and he doubts it will be the last. While he points out that Batman did not always get along with Gotham police in the comic books, he's more than happy to work together with officers — even if just for a photo. "The whole thing that I like to do when it comes to local law enforcement is to remember that not only do they have a job to do, also sometimes they can have a little fun while doing the work," he said. "It's a handshake that I'm happy to have with police." Lawrence has been portraying Batman for more than 20 years. He donned the cape and cowl when he was a teenager after his father passed away. "The story of Bruce Wayne and my own, unfortunately, are very similar," he said. Now, Lawrence patrols Brampton on foot and in his Batmobile — which he said is completely street legal. He claims to have also received three citations of bravery for helping stop crimes while out of his costume. As It Happens has not confirmed this. As for drivers who may see him on the road, he asks for safety to be top of mind. "My advice to fellow drivers definitely would be, please enjoy the sight and sound of, but with your cellphones it's not a good idea," he said. Written by Sarah Jackson. Produced by Ashley Mak.